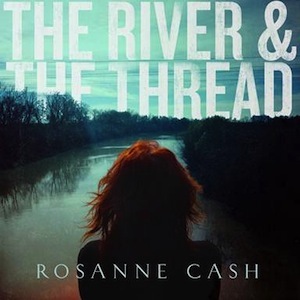 Rosanne Cash’s new album, The River & The Thread (out now via Blue Note Records) contains eleven songs she wrote with producer/ husband John Leventhal. It is an exploration of the music of the south and features appearances by Cory Chisel, Rodney Crowell (who also co-wrote one song), Amy Helm, Kris Kristofferson, Allison Moorer, John Prine, Derek Trucks, John Paul White (The Civil Wars), Tony Joe White and Gabe Witcher (The Punch Brothers). Cash has lived in New York City for two decades, but she reconnected with the south after a series of road trips to Arkansas, Tennessee and the Mississippi Delta. To promote the album she has appeared on the Late Show with David Letterman and CBS Sunday Morning (see clip below) and will visit The Katie Couric Show on Friday, Jan. 24. She will launch a North American tour with Leventhal, with highlights including an evening at New York City’s Metropolitan Museum of Art on Feb. 22. Cash recorded a podcast series about the project and posted an interactive map on Pintrest, linking song lyrics with specific locations. The River & The Thread follows 2009’s The List, which was nominated for two Grammys and won the Americana Music Award for Album of the Year.